Keysight Technologies (NYSE: KEYS), a leading technology company that helps enterprises, service providers and governments accelerate innovation to connect and secure the world, today announced that Ixia, a Keysight business, released the Ixia 2018 Security Report, highlighting the company's biggest security findings over the past year from its Application and Threat Intelligence (ATI) Research Center. The report analyses the growing exposure to cyber security risks as enterprises operate more of their workloads in the cloud. The second annual Ixia 2018 Security Report is the result of the company's extensive experience in network security testing as well as the company's focus on network and cloud visibility. Leveraging this expertise enables Ixia to extensively analyse an enterprise's increasing network attack surface as the perimeter of the traditional enterprise expands into the cloud. "Enterprises are now running business-critical applications and services in the cloud, and this report highlights the need for changes in the way enterprises secure their data and applications," said Jeff Harris, vice-president, portfolio marketing, Keysight Technologies. "Operating in the cloud changes security requirements. Enterprises need a strong security regimen that includes continuous testing as well as visibility down to the packet level to identify and control malicious behaviour before it impacts their business." * Cloud security and compliance are top priorities in 2018: an Ixia survey revealed that securing data and applications is a top public cloud priority in 2018. The dominance of cloud has impacted security teams as well, as they strive to deliver effective security in a hybrid, dynamically changing, on-demand environment. * The gap between cloud operations and security operations is growing: a Threat Stack study found nearly 73% of public cloud instances had one or more serious security misconfigurations. The combination of cloud growth and a high number of security misconfigurations suggests there will be more breaches in 2018 where cloud is a factor. * As cyber attacks evolve, more focus should be on visibility and detection: as enterprises continue to struggle with preventing breaches, a mind-shift is required to detect breaches once they occur, especially when an average of 191 days passes between intrusion to detection, according to a recent Ponemon study. * Cyber crime is good business (for cyber criminals): where 2017 was the year of ransomware, 2018 is primed to be the year of crypto-jacking. AdGuard researchers report that over 500 million PCs are being used for crypto-mining without the owners' knowledge. Mining crypto-currencies provides hackers with a high-profit return that is far stealthier than a ransom attack. * Encryption is making business more secure for customers (and hackers too): in 2017, over half of all Web traffic was encrypted. Hackers are exploiting this trend, hiding malicious traffic in encrypted streams, which makes detection via traditional means impossible. The advent of TLS 1.3 using ephemeral key encryption requires changes in the approach to encryption. 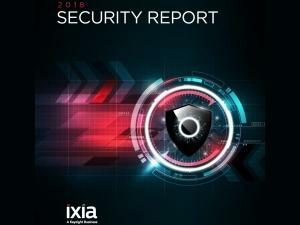 To download a complimentary copy of the 2018 Security Report from Ixia, a Keysight business, visit: https://www.ixiacom.com/resources/2018-security-report. Ixia, a Keysight business, is a sponsor at the ITWeb Security Summit, southern Africa's definitive conference and expo for information security, IT and business professionals. This year, over 70 expert speakers will deliver key insights across seven tracks, including workshops and training courses during the expanded five-day event. The ITWeb Security Summit will be staged at Vodacom World, Midrand, from 22-23 May 2018; and CTICC Cape Town on 29 May 2018. Focused and interactive workshops as well as in-depth training courses will be run in the days around the main conference and exhibition. For information on Security Summit Cape Town, go to http://v2.itweb.co.za/event/itweb/security-summit-ct-2018/. Registration is open for the ITWeb Security Summit 2018, being held in Johannesburg on 22 and 23 May and in Cape Town on 28 and 29 May. This is the must-attend annual event for information security professionals, featuring international speakers, workshops, as well as a beginners' guide to cyber security. Click here. Keysight Technologies (NYSE: KEYS) is a leading technology company that helps enterprises, service providers and governments accelerate innovation to connect and secure the world. Keysight's solutions optimise networks and bring electronic products to market faster and at a lower cost, with offerings from design simulation to prototype validation, to manufacturing test, to optimisation in networks and cloud environments. Customers span the worldwide communications ecosystem, aerospace and defence, automotive, energy, semiconductor and general electronics end markets. Keysight generated revenues of $3.2 billion in fiscal year 2017. In April 2017, Keysight acquired Ixia, a leader in network test, visibility, and security. More information is available at www.keysight.com. Additional information about Keysight Technologies is available in the newsroom at www.keysight.com/go/news, Keysight blog, and on Facebook, Google+, LinkedIn, Twitter and YouTube.